Today’s first was a simple one, and very much a spontaneous moment. The weather was perfect early in the day, reaching the mid 60’s before a cold front moved through, sending the temps plummeting. I decided to go get a Christmas tree while it was still warm. I won’t be decorating the tree for a couple of days, but at least it was pleasant selecting it at Lowe’s Garden Center. Greg graciously accompanied me with his truck to load the tree in the back. Last year I bought a small Fraser Fir Pine tree and LOVED it. I’ve purchased fresh Douglas Firs for years, usually 6 – 7 feet tall. But last year, wanting to change up the tree decorations a bit, and to conserve space, which is limited in my living room, I bought a shorter, smaller, Fraser Fir and enjoyed it so much. I embraced my new tradition today and immediately found the perfect tree. As we were headed to the check out, Greg asked me, “Do you want a fresh wreath?” I’ve never had one before. I’d been admiring them at the front of the garden center. I love a fresh Christmas tree because of the way it makes my whole house smell wonderfully woodsy. I have nothing against artificial trees….I just prefer a fresh one for my own enjoyment. The wreaths smelled just as wonderful. They were crafted from several types of evergreens, including fir trees, and have pinecones and little blue berries on them. When Greg offered to buy one for me, I said yes! 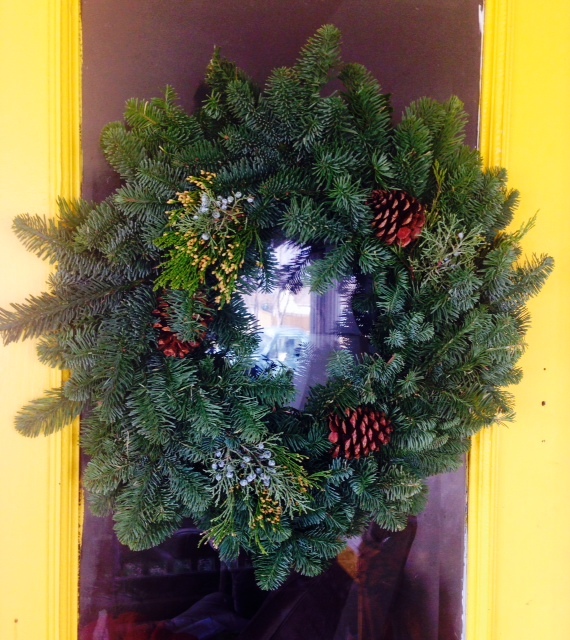 I selected a wreath and brought it home. I switched out the fall wreath hanging on the front door for the Christmas one. Every time I enter the house, I inhale the scent and sigh, happily. What a perfectly simple and beautiful first. Before the weather turned cold, I cleared the front porch of the fall items. That covered area is now ready to be decorated for Christmas. Inside the house, I packed away some of the fall décor and began cleaning. Greg climbed a ladder and handed down boxes of Christmas decorations. This week I intend to move slowly, from room to room, cleaning, fluffing, and decorating. I don’t want to purchase any new items, but use what I have, in different ways. This year I’ve enjoyed keeping pieces out and moving them to a new location or combining them with different items for a fresh look, as I’ve decorated for each season. So some of the spring items, rather than all going back into storage, transitioned into fall. And those will now appear in my Christmas décor. The bird cages and birds especially will feature in my decorating. I love this time of year. Partly it is because of Christmas and the way my home looks….so many candles flicker in my house that it raises the temperature on the thermostat! I look forward to time spent with family and friends. I spend time in silent meditation, grateful for the reason for the season and my spiritual journey. Also, December is a transitional month for me and I use this time to reflect on the past year, and release it. And I begin to think about next year and all that will unfold. It is a quiet, refreshing, magical time. I will have much to reflect on, as I finish up this incredible year of firsts. And, I am so excited about the upcoming year. My word, theme and symbol are all coming together, seeking me out, drawing forward into the next adventure. All will be revealed….soon!